With buses leaving the tunnel Saturday, there is no particular reason to be on the platform without a paid fare. 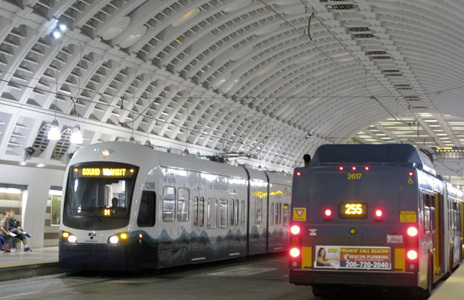 Therefore, Sound Transit will consider the platform a fare-paid zone beginning Saturday. “ORCA readers will be removed later, during the rollout of Next Gen ORCA,” said ST’S Kimberly Reason. As trains get ever more crowded, the platform will become the most practical place to enforce fares at certain times of day. Thanks Martin. I don’t mean to be negative, but I support faregates starting with these stations. Sometimes folks like me, yes me a 12 for transit, have forgot to tap on/tap off. They need more ORCA readers and purchase stations. And they need to remove the stickers that say Link Only. This transition is off to a truly cocked up start as could have been predicted. Yes.. But only link is in the tunnel so saying link only is redundant if technically true. Wonder what the budget is for the goodbye party to the tunnel that had to essentially be built twice before toy trains could actually use it. Great planning. Kind of like how some of the ORCA readers on the C line say for streetcars only in West Seattle? The tunnel didn’t have to be “built twice.” Only the tracks had to be laid twice, and that was Metro’s fault going way back to the ‘80’s. Metro was told by the SCC that they had to include rail in the original tunnel design to allow for eventual conversion of the tunnel to rail use, but Metro didn’t agree and didn’t want to spend the money to do it right. So they basically just embedded rail in concret. Yes, it meet the SCC’s edict of “including rail”, but the tracts were totally unusable, and that was Metro’s intent. Along came ST and ST had to dig them up and do it right. Once ST got rail actually running in the DSTT it was pretty clear to all observers that the days of buses in the DSTT were numbered, and that is what has gotten us to what we have today. A Rail only DSTT. ORCA readers: at least the stickers are accurate. Some RapidRide readers had stickers saying “tap for RapidRide only BEFORE 7 PM” years after the 7pm rule was repealed. DSTT rails: There were two issues. One, the shoddy way they were installed, because rail was so far into the theoretical future and nobody knew whether it would really happen. Two, a half-decade later, low-floor trains became common and eventually took over the industry because they made life much better for wheelchairs and more convenient for everybody else. Having Orca readers at the platform greatly increases throughput for tapping off, they should keep them. Sound Transit fare enforcement also needs to implement King County’s recent equity measures: stop charging the people least able to pay massive tickets and instead use the interaction as a connection to get people signed up for Orca LIFT. God forbid people pay their fare or be held accountable for their entitled attitude. Good Grief, Should STB charge by the Comment? Sound Transit should put dummy turnstiles on the mezzanines of tunnel stations. They’ll turn no matter what but they will remind people that you can’t tap your card on the platform anymore. A better plan would be to emulate the old RFA by adjusting the fare chart to make all trips between any two downtown tunnel stations $0.00. That way, people can be on the platforms fare free and fare enforcement can be on board ready to start checking fares after the train leaves the tunnel. Either a real turnstyle, a fake turnstyle, or the outline of a doorway would be effective. Something that people go through single-file and has an ORCA reader right in front of you at eye-to-hand level. The surface stations at SODO and Rainier Valley are close to that. That gives you the visual reminder to tap, and the sense that you’re transitioning from one status to another, so if you go through it without paying you’re doing it intentionally rather than just forgetting or thinking about something else. The current “Fare Paid Zone” signs and reader locations don’t work because they’re not in people’s line-of-site or they’re at the side of a big room rather than at a narrow doorway-thing. I’ve forgotten to tap off at Beacon Hill multiple times because the readers are on the side and behind you when you exit. I’ve forgotten to tap off at Kent Sounder because the readers weren’t in my line of sight, I rarely use the station, and I was thinking of something else. I only remembered after I got on the 169 and it was ten minutes away. I’ve forgotten to tap in sometimes at various elevators because the readers aren’t in your line of sight. I’ve seen how some of the “Fare-Paid Zone” signs are way up near the ceiling and not where people are definitely looking as they enter some stations. And I’ve met many people on platforms, mostly in the DSTT,, that are oblivious about the need for a ticket and where to get one. I tell them they should go upstairs and get a ticket or preferably an ORCA card, but they often don’t think it’s worth it to go back up and down. All this would be minimized if we had proper turnstyles or something that looks like a doorway. Given plans of the stations I could mark off these areas within an hour, even taking into account where the ticket machines are located (important only with turnstiles, not other barriers) and elevators. The only elevators that would require their own card readers are those that travel directly from street to platform and cannot be included in a fare-paid area directly. Even at Beacon Hill you could create this area outside around the elevator banks or at the entrances to each platform from the elevator “lobby.” The south access to Capitol Hill on Denny has the elevator located inside; the barrier would be outside of that. Several elevators require a transfer at the mezzanine level so they are not issues. There would still be some where we would need to maintain the reader at the elevator, but moving forward no station design should incorporate that sort of thing. Again, this is best practice literally everywhere. Brent, your point about the double beep is valid and it will indeed be interesting to see how much it helps when the numbers come out. I also fully agree that possession of a valid pass for the maximum possible train fare should be prima facie evidence of paid fare. I would think that good station design would lead to less fare enforcement required on trains; those folks could be moved to stations (watching for “turnstyle” jumpers) and act also as information and help staff. This would clearly include assisting people who need to know where and how to obtain the reduced fare cards. Do we also need to put fake turnstiles in front of the elevators? I like the part where everyone gets a warning, and it falls off after a year. And then give the recipient some time to get to one of the places along Link that distributes RRFP, youth, and/or LIFT cards. At least provide that information rather than a silly pamphlet on how to tap. Provide that info in whichever language the recipient can understand, along with a card describing the warning in that language. I also appreciate the double-beep on exit, which should dramatically reduce the number of false positives reported as real positives by the enforcement section. We shall see in the ridership reports. Still, having a fully-paid pass ought to count, regardless of tapping. Statistics, not wasting time dressing down passholders over failure to tap and wrongly accusing them of attempted theft, is the smarter way to handle those situations. Whatever solutions there are to allow the homeless population to ride, we’re living with the natural results of zoning policies that were once focused on racial segregation and are now focused on class segregation. We can’t get more people into housing that doesn’t exist. We need to design stations so that this dilemma doesn’t come up. It’s hard to retrofit a station that was designed without much thought to an effective payment system but just assumed riders would go everywhere to tap and get to the elevator and would always remember to do it perfectly. So does this mean the tunnel is now officially Sound Transit property and Metro has nothing to do with it anymore? That’s the intention. I don’t know whether ownership transferred at 4am Saturday morning or at the end of the month or in a few months, but the general intention is that ST would take ownership of it when buses leave the tunnel, and ST would be responsible for all its remaining debt at that point. That’s one reason why ST didn’t try to get buses out of the tunnel earlier, because it was paying a portion of debt based on its percent of trips in the tunnel. The readers despateately need to be placed between the vending machines and the platforms, clearly delineating a paid fare zone. The current backwards placement logic of having the vending machines between the readers and the platforms exists at many entrances. It’s so stupid and confusing! That’s a big problem at Seatac too! Yeah I had friends come visit and I met them at the airport and we took Link. When you get to SeaTac station there are those metal things you walk through with the readers next to them, and my friends treated them like an invisible wall. I tapped and walked through and they just stood on the other side and stared at me until I told them to walk through and come to the vending machine. I don’t think that’s a big issue, since having extra readers helps a lot with throughput. I think a better way to accomplish this is to make the readers next to the stairs, escalators, and elevators more prominent with “PAY BEFORE ENTRY” stickers in all caps replacing the “link only” stickers. It isn’t a big issue but it is an issue. Given the minimal costs to extend electrical and communications for relocated readers — or electrical and communications for relocated vending machines, it’s an easily solvable problem. It just takes a little money and a little better design — and the will to think about the rider experience more rather than think that all prior design choices are infallible. The barrier design is actually very good there as a barrier – but as you say, it’s in the wrong location! I think it was probably a function of ST not caring about “fare paid” area but rather not wanting luggage carts to be brought into the station and left. Now, that’s another story common to American airports of not making it easy for people to get their luggage to and from the airport, but that’s more a matter of the airport and not ST.
That said, I would still move them to either side of the vending machines so as to alleviate confusion. As you rightly point out, Brian, barriers like that do act as an “invisible wall” which is precisely the point of them. They just need to be located correctly to achieve their purpose of reminding people to pay (tap on/off). Yes I agree. Separate the v-shaped barrier to have half south of the vending machines and half north of the vending machines. That would give the electric shuttle drivers to the terminal more room to turn around too. The current design was never intended to accommodate those, and the drivers have challenges when turning around there. How many times have ST Fare Inspectors cited riders for not paying in a “fare paid” zone that’s not on a train? I think the answer is zero, or next to zero.